Usually the NH winter is a time when the bets are laid for the summer minimum. Friend Weasel was not too excited last year although things were, as they were pretty, but not astoundingly (see 2011) low. 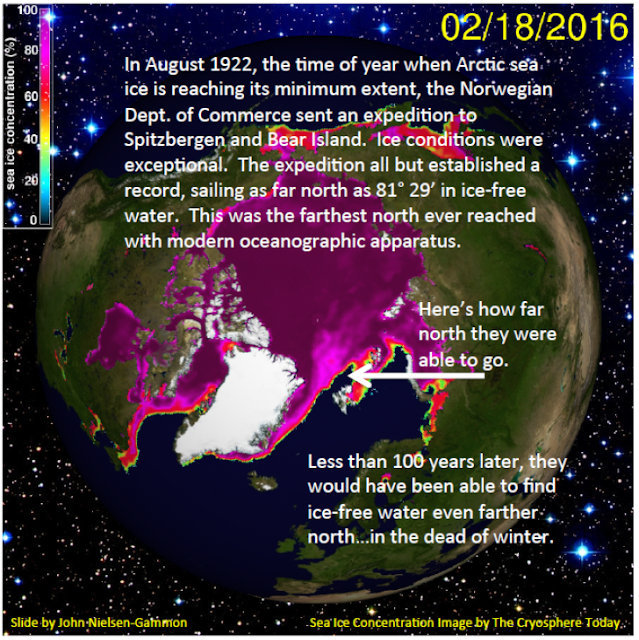 This year already astounding things are happening, or perhaps better put not happening, in the Arctic winter. Not that there is no ice, but there is a lot less ice than expected. Enough less that 2016 looks like a lock for the lowest global sea ice evah. OTOH, the resolution of Cryosphere Today is a bit low, so let's take a look at the higher resolution images at the University of Bremen from the AMSR2 (2016) and the original AMSR (2003) for February right now and then. But wait, there is even more, at Neven's Arctic Sea Ice Blog and Gerg has a GIF of the sea ice in August from the Danish Meteorological Institute’s sea ice maps between 1920 and 1939. Today's February looks pretty much icewise like August then. Is melted sea ice potable? 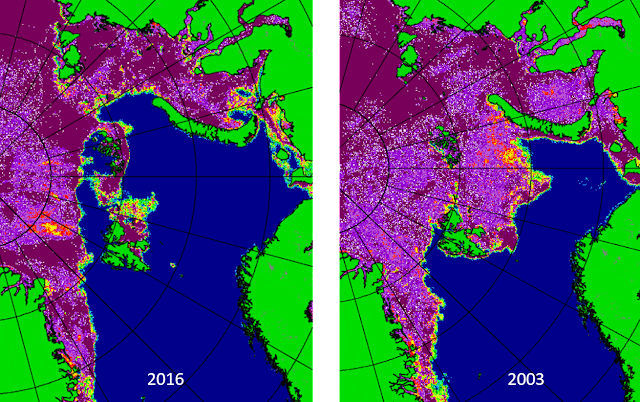 Sea ice area and extent are at record lows for this time of year, but it's really early to start predicting next September. On average, ice area tends to increase for several weeks yet, and weather over the next several months will have a big role to play. We could easily have a record melt this year - or not. I have $10k riding on it not being too bad this year; sounds like I need to get blogging. FWIW my Gaussian Process regression from previous September observations is predicting a September mean extent for 2016 of 4.27 (+/- 1.15) million square km. Apropos Brian's predictable human reactions post today, Willard Tony blares: "DMI disappears an inconvenient sea ice graph"
... and then accuses Neven of being "abusive" for suggesting that there's no conspiracy. I couldn't make this stuff up. ... accusation of "abuse" AFTER disappearing Neven's follow-up comment. Need another irony meter, stat. Back in October I posited that 2015 was likely a precursor to a big extent and volume loss in 2016. No regression analysis or trends - just heuristic pattern matching from previous years. Schröder and WC and Tietsche et al showed an arctic returning to trend 5 years after artificially removing all the ice. This showed an important negative feedback that goes with ice loss. We see this after the large extent loss years of 2007 and 2012. The subsequent years returned towards trend. We've had 3 intervening melt seasons since 2012 and I thought conditions looked ripe for another step down. Given that NH snow cover is at an all-time low for the date, sea ice extent is at an all-time low for the date, volume is probably 2nd lowest only to 2012, and arctic temperatures continue to increase - with even average weather we should see a melt season that rivals 2012 and if weather is particularly conducive to ice loss we'll see a new record. Interestingly, if volume comes in just a little lower than 2012's minimum - Maslowski will have his predicted nearly ice-free Arctic right on schedule. Well said, Kevin. That's exactly how things stand right now. If the winter keeps going like it has been so far, and then the melting season is off to a flying start (it was very slow in 2013 and 2014, and slightly less slow in 2015, compensated by a hot July), it's anybody's game. As for Watts: he made a stupid mistake, and now he has to bury it. 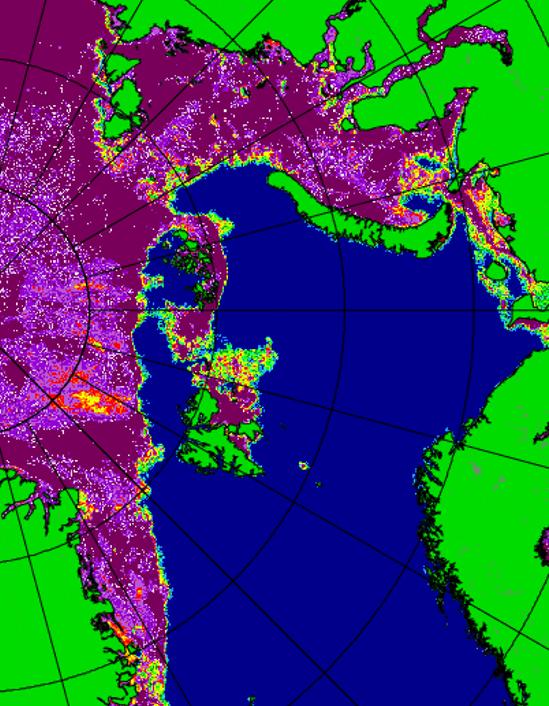 To answer David's question, looks like sea ice isn't potable, or not very potable anyway. Brine gets caught in it. 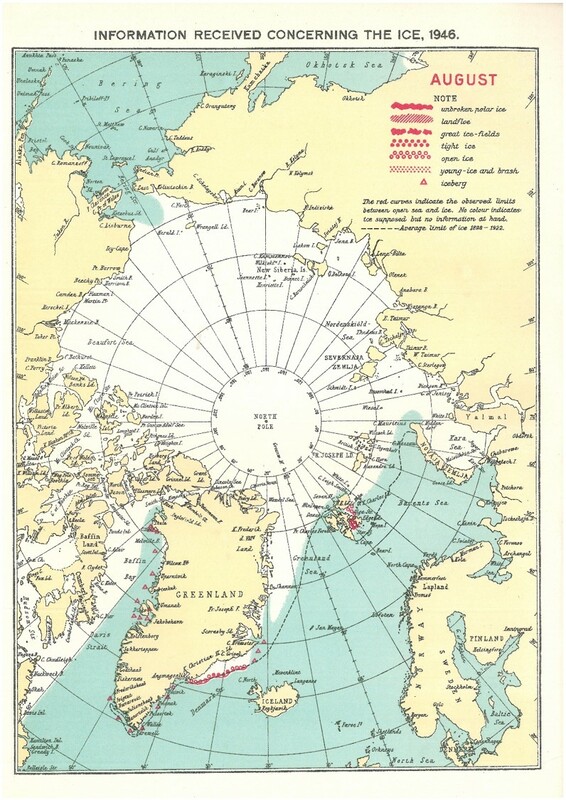 Old multiyear sea ice tends to release/drain the brine away. Have fun finding any. Unlike icebergs, towing sea ice to make freshwater isn't feasible, and even iceberg towing was found to be more expensive than ocean desal. I arrive here with a hop, skip and a jump, belatedly redirected from Climate Etc.